When I announced I'd be quitting my full time job to pursue my passion for food and blogging around this time last year, I also made a personal commitment to take time to volunteer (something I've wanted to do, but hadn't made the time for). 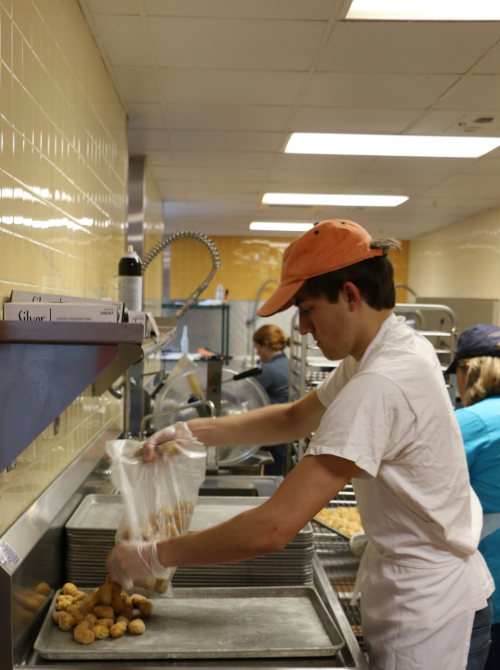 Volunteering for me has taken shape over the past year in a weekly format at FeedMore's Community Kitchen, which happens to be right down the street from us here in the city. Well, almost a year later, and with the exception of occasional commitments, my volunteer slot remains Wednesdays from 1-4pm. It's been an invaluable learning experience and the opportunity to work amongst other talented culinary professionals and volunteers just like myself! Today I'm excited to share an inside look at what a day in the life is like for me when working at FeedMore. 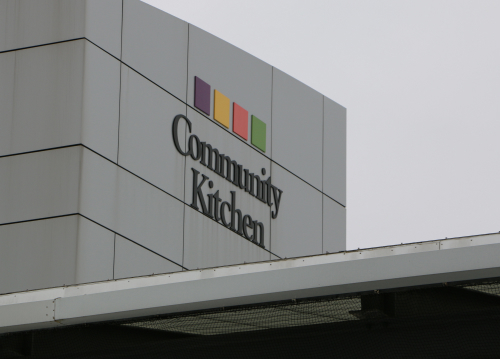 Built in 2007 by the Central Virginia Food Bank and Meals on Wheels, the community kitchen is a space where individuals come together to plan and execute meals for a great cause. Volunteering to work in this collaborative space has allowed me to gain some experience working in a full industrial/commercial kitchen — learning the equipment, techniques and how to build meals from recipes that will feed hundreds of people at a time (a little different than my normal cooking for 2-6 people from the comfort of my home kitchen). 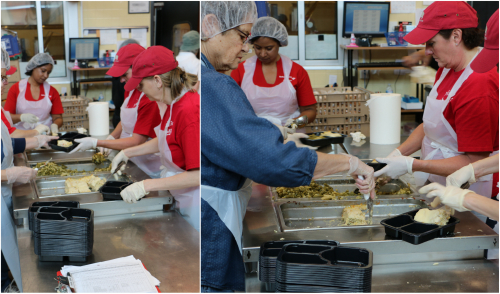 Volunteers can be assigned to many different areas from prep, to packaging, and with some experience we actually construct and cook recipes. My son, Brandon, volunteering with me last week. 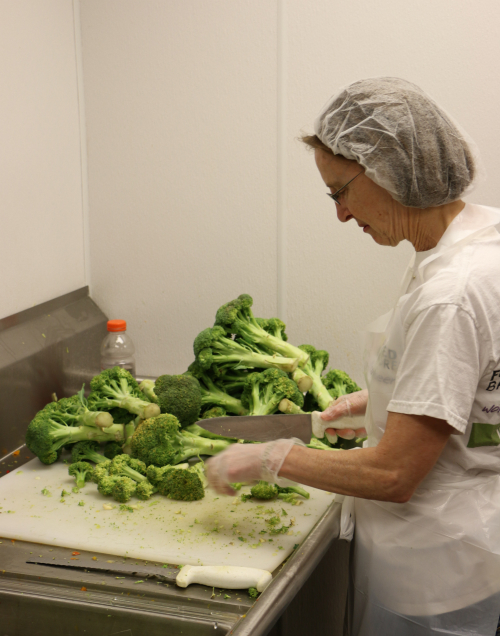 Besides volunteers there is a staff of full time culinary professionals working side by side with volunteers. 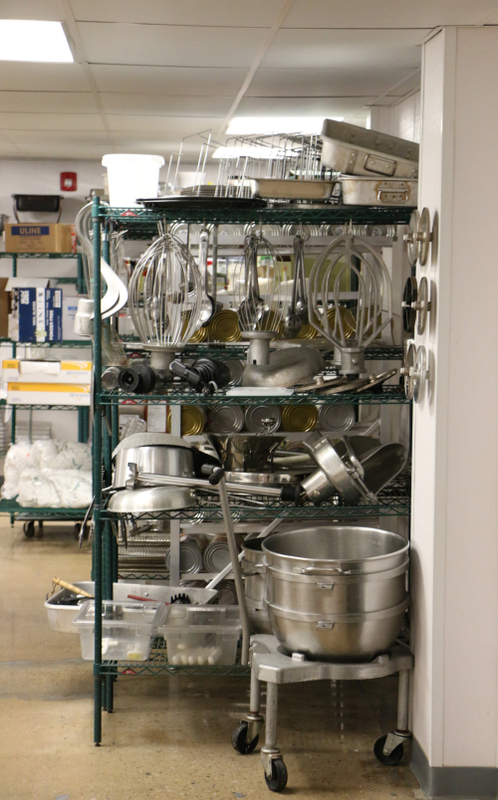 They take the time with volunteers to help familiarize you with equipment, procedures and just finding your way around the kitchen. 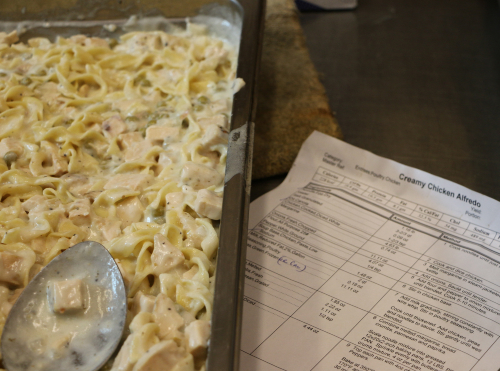 To give you an example of the magnitude of food being prepared on this Wednesday, the main meal being prepped was a creamy salmon Alfredo, steamed seasoned vegetables, and pineapple macaroon crisps. About 1000 servings had to be filled just for the above main meal alone. The kids meals being prepared were beanie weenies, roll, summer vegetable salad, apples and chocolate milk. 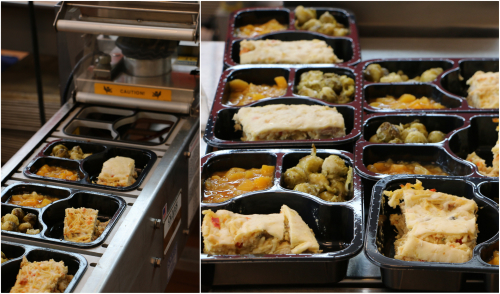 1,706 meals were being prepared for for delivery on Thursday. 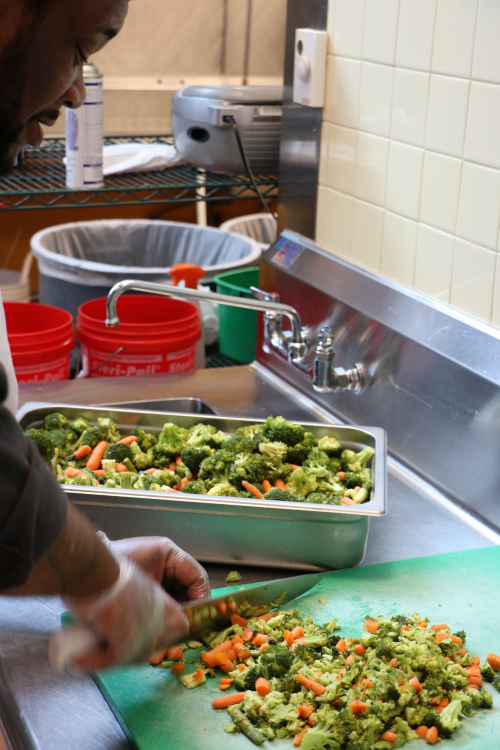 Since some of the meals may be going to people with special dietary needs or for people who may not be able to chew solid foods, the care is taken to chop vegetables finely to be able to accommodate those with special needs. 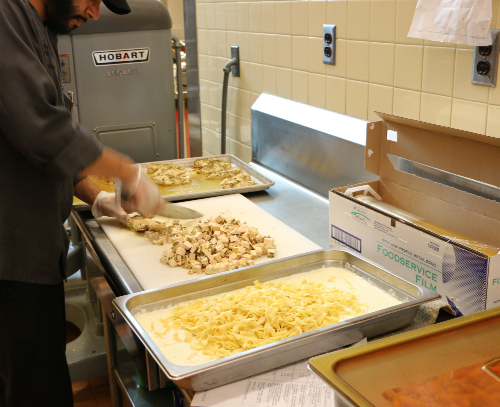 Once food is prepared and ready, some will go to packaging for the Meals on Wheels program where on average, 1,800 elderly and homebound citizens are served. 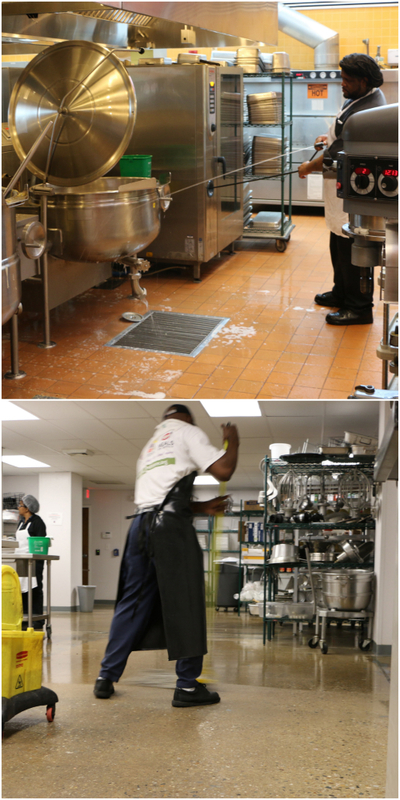 Of course at the end of the day, everyone pulls together for a full wash down of the equipment, counters and kitchen — getting everything ready to begin again the next day. Donate food — Place a box in your business to collect canned and non perishable goods. 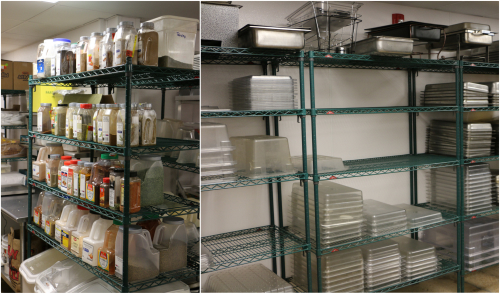 Volunteer — FeedMore is always looking for volunteers. You do not have to commit to 4 hours weekly but you can volunteer individually or work with your place of employment and get a group together for a rewarding team building experience. Plan a fundraising event — Work with your business or local organization to help generate funds for a good cause like FeedMore. Get assistance — maybe you just know someone in need. 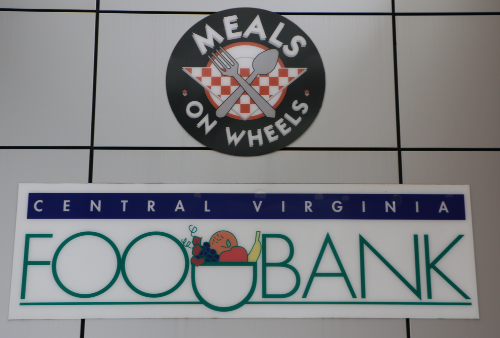 Of course there are many food banks and volunteering opportunities throughout the country outside of FeedMore in Richmond, Virginia. Here is a helpful link from Feeding America to help find a place in your area to get involved. 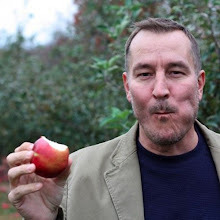 That's so cool Tim! I love that you're volunteering in such a cool place. I can't believe how much food has to get made! So impressive (and sad that there are so many people in need). Thanks Tara for the kind words and I agree it is sad on many levels. What a great behind the scenes look! Thanks for sharing it with us.